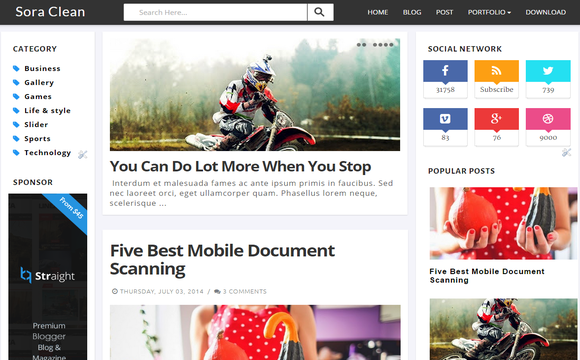 Sora Clean is a feature rich Blogger Template which comprise of clean designs and flexible functionalities. By using this Template you can get the professional way to well design a fully fledged magazine website. It’s a perfect template choice for creating any sports magazine, city magazine, life style magazine, informative, business, employment and anything in between. Its offers user several styling options while making it easier to do desired changes. With a focus on reducing bounce rates, while increasing ad exposure, this theme will keep your visitors scrolling with more content all while maximizing your ad revenue! love this most... very informative for lover of clean bloggers.